Think MakeItHappen crushing Lyfestyle in two games was a flood? It should have been a deluge of Noachian proportions. MakeItHappen held Lyfestyle to four (4!) points in the second quarter of the second game of their best-of-3 wager series. They swept the series 2-0, winning 62-47 and 66-46. It wasn’t that close. Let’s compare position by position. 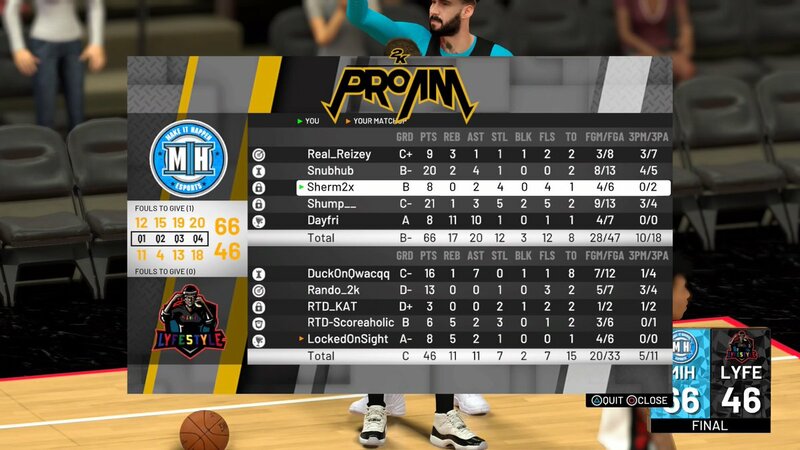 Reizey played more of an offball scoring role at pure sharp. He moves well without the ball, and I should think he’s had better series when playing as the primary ballhandler. He helps a little too aggressively at times on defense, but he leaks out pretty efficiently. Most importantly, he knows his role and plays it. And then there’s Qwacqq. Qwacqq totaled 40 points, 12 assists, and 15 turnovers for the series. He can be explosive, but he’s also a big problem the moment he gets stuck on offense, which happened quite often in trying to run a PnR and switching onto Dayfri. He can be a good, incisive scorer; he can also disappear when not running the show on offense. Court vision and decisiveness on offense must improve. His onball and offball defense are both suspect, and though he wasn’t generally poor at sticking with wrappers up top he seemed often a step slow in reacting. Rando is sort of the flip side of Qwacqq in that he can be an effective offball scorer, and probably would have been had either the team run more plays for him or been playing a worse defense. He’d work in a catch-and-shoot focused offense, which would need a true playmaker. On defense, the awareness, reaction speed, and anticipation all must improve. Snubby wasn’t terrific this series. He was the primary ballhandler for the majority of MIH offensive possessions, but I don’t think that’s sustainable or the position he should be playing in the long run. I don’t think he’s particularly adept at playmaking, or has enough immediate decisiveness, to play point guard. His defense was solid, and he’s also pretty good at leaking out efficiently (Dayfri’s outlet passes help a lot). He probably projects more as a secondary scorer as long as he can stay tight on pure sharp movement. Sherm played most of the onball defense for MIH. I think he’s a better defender when he doesn’t do too much and primarily plays the angles, and he definitely played more in that manner in the second game. He’ll never be a first or second scoring option, but if he hits his shots with a little more consistently he’ll be a very viable plug-and-play guy at any defense-first position. KAT was pretty quiet on both sides of the ball. I don’t think he’s particularly incisve on the dribble from the wing, and he didn’t get much of a chance to display his shooting (which was solid). He’s not an elite defender, but he has a solid foundation. One very positive thing in his favor: KAT was the only Lyfestyle player to eventually realize that he could rotate onto Boo in the corner, which eventually forced Boo to adjust a little. Scoreaholic showed some very solid rebounding. It overlapped, however, with a seemingly innate need to sag into the paint (a trait shared by his teammates), which opened Boo up time and time again. Again, the Lyfestyle offense didn’t really create much to do for Scoreaholic, but I should think it’s a fair assessment to say that they wouldn’t have won or lost by any more if it had. Boo is still so good. He rotates effectively and in a timely fashion on defense. He shot the lights out in both games, scoring 30 and 21 in games 1 and 2. A large part of that was the fact that Lyfestyle simply kept leaving him open time and time again, but he hit 75% shots. If I had a dime for every time he just ran to the corner after inbounding and drained an open jumper, or got an uncontested three off a Dayfri offensive rebound and kickout, I’d be almost as rich as if I’d bet on MIH to cover the 15-point spread. This was an ugly matchup. Dayfri, though, was absolutely phenomenal, posting a triple-double in game 1 and falling a basket shy in game 2. He grabbed rebounds, sucked in players on rolls to the hoop, and made skilled outlet pass after skilled outlet pass. Then on defense, he stepped up and took away the Lyfestyle pick-and-roll game. He had numerous chase-down block animations, rotated well, and even stepped in the passing lanes. And then there was LOS, whose acronym leads nicely into the team’s LOSS. Dayfri obliterated him on the boards. His screens weren’t particularly effective. His roll gravity is null. He made some solid passes, but the times when Lyestyle ran the offense out of the high post just paled in comparison with the times MIH ran it. I think Dayfri is going to enjoy playing alongside Boo with Wizards DG. Moreover, he’ll like D.C. lifestyle.